After migrating out Exchange 2007 server to Exchange 2010 I got on several outlook clients Sync Issues. When you look at the log it says: The following message had an error and synchronization of it was skipped (0x00050b). Solution: Just before the error it gives Synchronizing server changes in folder ‘foldername’. When looking in the folder via Outlook no strange items were seen in this folder. When logging on to OWA and browsing to the folder I found an item witch was corrupted. Looking back in outlook the item wasn’t visable so it looks like outlook removes corrupted mails. So You have to remove the corrupted item via OWA. Posted in Blog, Exchange 2010 at September 20th, 2010. No Comments. When you install a Exchange 2007 or 2010 client access server and using outlook 2007 or 2010. You will get a autodiscover error by default. Also connect with outlook webaccess or web app you get a certificate error. To solve this problem you will have to import the certificate on all computers. Another way is to buy a trusted third party certificate. In most cases this will be a SAN / UCC certificate so you can use multiple names on the certificate, webmail.domain.name, autodiscover.domain.name, servername.domain.name and for a transition legacy.domain.name. But after you request and installed the certificate you still get a autodiscover or certificate error. Possible solution: you will have to change some autodiscover and client access setting, I will describe the wat to check and change the settings with the Exchange management shell. Some settings can also be changed by GUI. For the next options you can set for both internal and external a different url. But you can choose to use same url for both in that case you will have to setup your internal and external dns right. You will have to do the same thing for all the next option. If you don’t use one of these options you can consider skipping the setting. Posted in Blog, Exchange 2007, Exchange 2010 at September 3rd, 2010. 3 Comments. Default outlook 2003 cannot connect to a default exchange 2010 instalaltion. This is because exchange 2010 uses by default RPC encryption to communicate. Outlook 2003 has this default disabled. 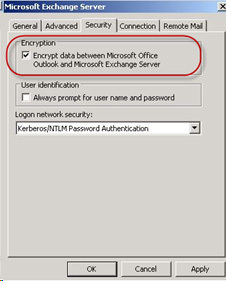 Solution: Enable encryption in outlook 2003. Other options to solve this problem is disable rpc encryption on the Client Access Server (this is not the prefered option) or via outlook profile or via group policy. All options are described in this knowledge base article. Posted in Blog, Exchange 2010 at July 19th, 2010. 3 Comments. After you attach a Exchange 2010 Client Access role server to a Exchange 2007 environment you get an “An IIS directory entry couldn’t be created. The error message is Access is denied. HResult = -2147024891 It was running the command ‘Get-OwaVirtualDirectory’.” when you go to Server Configuration, Client Access in Exchange 2010 management console. Solution: Because Exchange 2010 tries to read some information from the Exchange 2007 server, you have to add the “Exchange Trusted Subsystem” security group to the “local admin” group on all Exchange 2007 servers. Posted in Blog, Exchange 2010 at July 17th, 2010. No Comments.